Figure 7. Accumulation of apoplastic superoxide (O2•-) in Lepidium sativum embryos extracted from seeds incubated without (CON) or with 5x10-4 M MyA (MyA) in darkness. (a) In situ localization of superoxide radical O2•- by NBT histostaining of embryos isolated from CON- and MyA-treated seeds incubated in darkness for 15h and 22h. Seeds without endosperm rupture (-ER) are presented for CON and MyA-treated seeds at 15h and 22h of incubation and with completed endosperm rupture (+ER) for CON at 22h. Left images show the lower, right images show the upper side of the embryos as positioned in the seed during incubation in the petri dish. 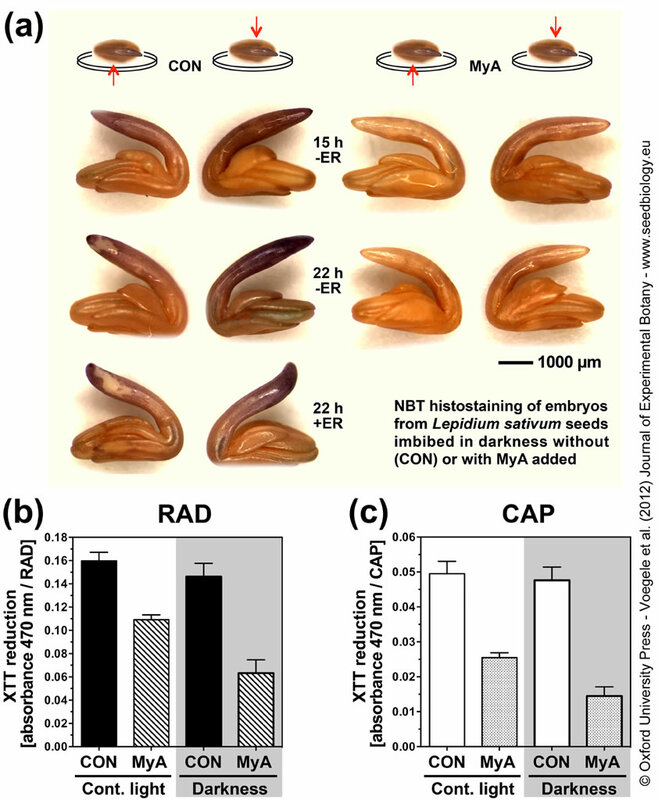 Quantification of apoplastic O2•- production using the XTT assay in (b) RAD (radicle+lower hypocotyl) and (c) CAP (micropylar endosperm) isolated from CON- and MyA-seeds incubated for 22h in darkness (this work) and for comparison in continuous light (Oracz et al. 2012). Mean values ± SE of four biological replicates.